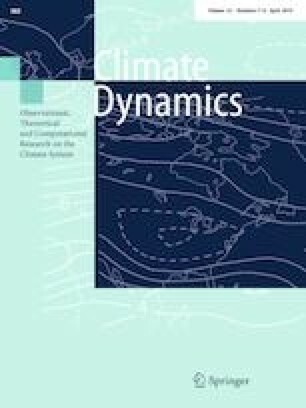 This study analyzes the dominant modes of interannual variability of surface air temperature (SAT) during boreal autumn over the mid-high latitudes of Eurasia and investigates their associations with snow cover, atmospheric circulation and sea surface temperature (SST). The first, second and third empirical orthogonal function (EOF) mode of autumn SAT anomalies displays same-sign distribution, an east–west dipole pattern and a south–north dipole pattern, respectively. Analysis of surface heat fluxes indicates that snow changes explain only small patches of SAT anomalies related to the first two EOFs via altering surface shortwave radiation. Atmospheric circulation anomalies have important contributions to the formation of SAT anomalies. Southerly (northerly) wind anomalies generally favor positive (negative) SAT anomalies via bringing warmer (colder) air from lower (higher) latitudes. The atmospheric circulation anomalies related to the first EOF mode are attributed to a combination of the Arctic Oscillation (AO) and the Scandinavia pattern and those related to the second EOF mode have a close relation with the East Atlantic/West Russian (EAWR) and circumglobal teleconnection (CGT) patterns. Formation of the atmospheric circulation anomalies related to the third EOF mode is partly related to the Arctic sea ice change around the Barents–Kara Seas. SST anomalies have little contribution to the atmospheric circulation anomalies associated with the first three EOF modes of Eurasian autumn SAT interannual variations. Hindcast skill of the SAT anomalies related to the first (second) EOF mode is improved when taking both the AO and Scandinavia (EAWR and CGT) patterns into account. We thank two anonymous reviewers for their constructive suggestions, which helped to improve the paper. This study is supported by the National Key Research and Development Program of China (Grant no. 2018YFA0605604), the National Natural Science Foundation of China Grants (41530425, 41775080, 41721004, and 41605031), and the Young Elite Scientists Sponsorship Program by the China Association for Science and Technology (2016QNRC001).